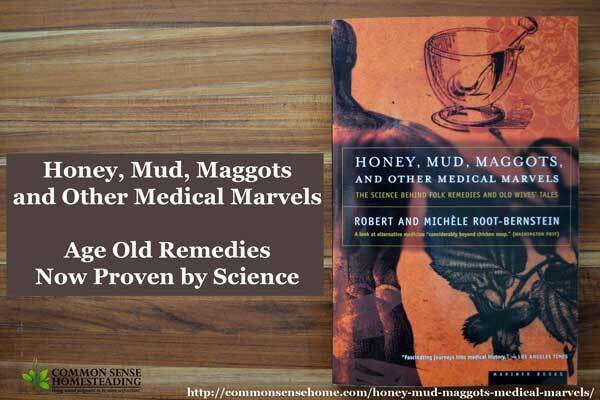 Honey, Mud, Maggots and Other Medical Marvels – The Science Behind Folk Remedies and Old Wives' Tales is a journey through history and culture, highlighting the use of unusual remedies around the world. Although some of these techniques may sound strange or disgusting, most have stood the test of time because they work. As I was reading, I couldn't help but think of how these often primitive techniques could be saving lives if only more people knew about them. In a survival situation where you don't have access to modern medicine, you have to use what you have on hand. We've already talked about using honey as medicine on the site, but did you know you could use a cellophane wrapper as an emergency bandage? Back in World War II, cigarettes came wrapped in cellophane packaging for the first time. In several different locations, medical personal started using the cellophane wrappers to cover wounds instead of the gauze wrappings that were commonly used at the time. They found that unlike the gauze, which stuck into the wound, the cellophane did not adhere to wound, and the wound was able to drain around the edges of the cellophane. Medical personnel could also monitor the wound more easily through the clear covering. Wounds covered in cellophane healed quicker with fewer complications. Long term, this led to the development of modern no-stick wound pads. And the phrase “licking your wounds” likely has its roots in the actual licking of physical wounds on people. In many cases, saliva speeds healing and reduces the rate of infection – no joke. There are historical records of humans licking their own wounds and other people's wounds, as well as humans having their wounds licked by faithful dogs and even a female moose. I'm not likely to go out in search of a licking moose, but I admit to occasionally sticking an “owie” – a small scrape, cut or bug bite – in my mouth out of instinct. It seemed to help at the time, and it appears I'm not alone. Bloodletting might sound like one of the most illogical practices, but applied correctly, it can be used to lower a fever. It has also been used successfully to treat angina and high blood pressure. The males in my husband's family have a tendency towards excess iron production in the blood (hemochromotosis). The treatment – regular blood draws or donating blood. Bleeding is not just an historical footnote. The humble maggot could likely have saved many lives and limbs back in the Civil War, if they had only known how to use it properly. The correct maggots are astoundingly precise at removing dead tissue, and do so with virtually no pain and more cleanly than a surgeon. I could go on and on. 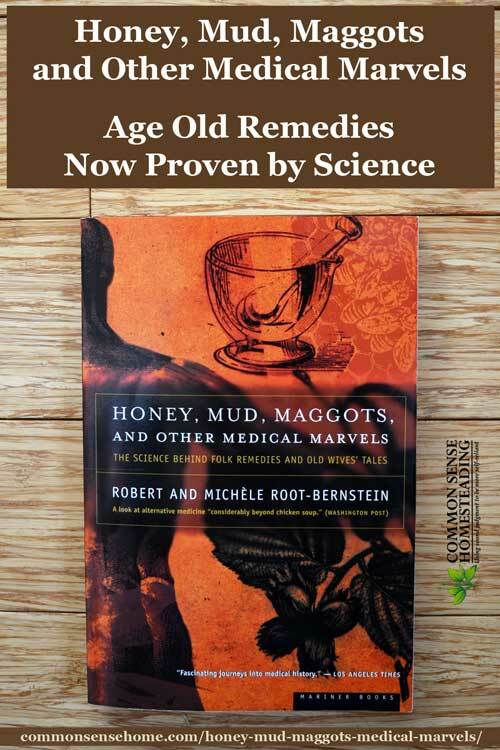 This book had me up late at night reading page after page, thinking about how these different treatments might have been able to help family members in the past (mom had a blood clotting issue that likely would have been well treated with leeches, without the side effects of the medications), and how I could use them in the future (honey is one of my go to treatment now for cuts and burns). This book is not a how-to manual, but I consider it a must read to those who are willing to think outside the box and evaluate the usefulness of non-standard medical care. We might not always have access to a doctor or modern medicine. (Just take a look at the situation in Venezuela.) You just never know what life will bring. This sounds like a definite must-read. I’m adding it to my preparedness library! It’s not brand new anymore, so it’s super cheap, too. The copy I have is softcover, copyright 1997, that I picked up at a used book sale. I *think* it’s the same edition as the ones on amazon, just with a different cover. Well, I can tell you from recent experience (last ten years or so) that medical maggots are in current use for wound care. They do a fabulous job of cleaning dead tissue off wounds. You count how many you put in…and count how many you take out. Very short duration of use but they really work well. Leeches are in current use for several concerns including keeping blood flow in a reattached limb or graft. Honey is in a lot of dressing materials, there is a whole line used by a major medical supplier and silver has been in use for a looonnnnggg time. Silvadene is a common burn treatment and I used it in 1982 on a soldier who had a grenade simulator go off in his hand causing a bad 3rd degree burn. It is also in a whole line of supplies as well. They also use a vacuum dressing called a “Wound Vac”. They are excellent at speeding healing if used correctly. That isn’t an ancient method but it is an unusual one. I also believe in sometimes letting things open to the air, soaking in Epsom salts or swimming in a pool (chlorine helps dry things up and sterlize and the water flushes out the wound). Of course, some of your readers might freak out at that, but I am just telling you what goes on every day. And if you calculate the amount of “toxin” in a regular size swimming pool-it would be in the parts per million range….certainly no longer a problem. But you should also know, I took a CDC food safety quiz and barely passed. I believe in NOT refrigerating peanut butter, butter, jam, ketchup, mustard and mayonnaise (once it’s been put in a salad or on a sandwich). Mayo was a method of preserving eggs for our ancestors who did not have refrigeration or canning….. But I digress. This looks like a good book to have in your home library. Thanks for posting this. As always, I learn so much from your blog. I don’t think the CDC necessarily offers the best options for all scenarios… Mom kept most of those condiments out on the table, too, with the exception of mayonnaise. I found your comments interesting. Never be afraid to share useful information here, even if it’s only tangentially related. I think there’s a lot of information that we will need to relearn and experiment with if we’re going to have any chance of coping with the new generations of potentially lethal bacteria and viruses.